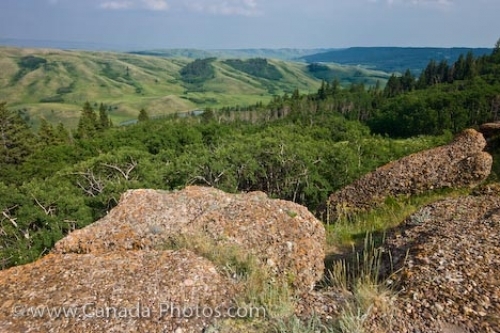 The rolling landscape of the Cypress Hills Interprovincial Park is seen from the Conglomerate Cliffs. From the rocky ledge of the cliffs, evergreen trees and rolling hills go off into the far distance. A few mountain ranges are seen in the backdrop. Large crevices run through the hillsides. View of Cypress Hills Interprovincial Park from the Conglomerate Cliffs viewpoint, Saskatchewan, Canada.